Reverb is an essential element in nearly any rig. Whether you’re adding dimension to your sound or drenching your signal in sparkling reflections, our Marine Layer Reverb can do it all. Multiple reverb types, including classics like Hall and Room along with modern marvels like Shimmer, make this an indispensable pedal in your signal chain. 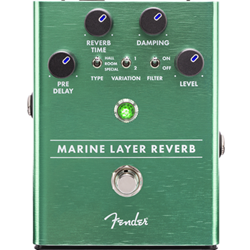 The reverb tails continue when the effect is muted, ensuring a smooth and natural decay.Designed by our in-house team of experts, the Marine Layer Reverb is an all-original circuit. We consulted with a plethora of players while designing this pedal, and the resulting stompbox is packed with stage-ready features. The chassis is crafted from lightweight, durable anodized aluminum, and the Amp Jewel LED gives your pedalboard the classic Fender look. The LED-backlit knobs show your control settings on a dark stage at a glance. We even made swapping batteries quicker and easier with our exclusive "patent applied for", magnetically latched 9V battery door.Create full and lush sounds with Fender’s new Marine Layer Reverb.